Today was such a good day! It started off with a wonderful breakfast with my friend Elise and her son, Jordan at Panera. Bagels and good "catch-up" conversation. :) After that, I headed over to Caitlin's for crafting! We had a lot of fun making stuff and catching up as well. Her housemate, Esther, joined us after lunch. Unfortunately, I got caught up in talking and forgot to take step-by-step photos of the wreath I made. I will do my best to explain in detail what I did. Don't worry... It wasn't that difficult! 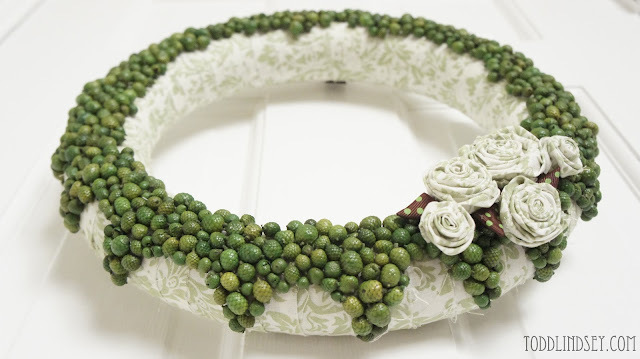 I started off with a green floral foam wreath. I wrapped it in strips of fabric, periodically hot gluing it to keep it in place. 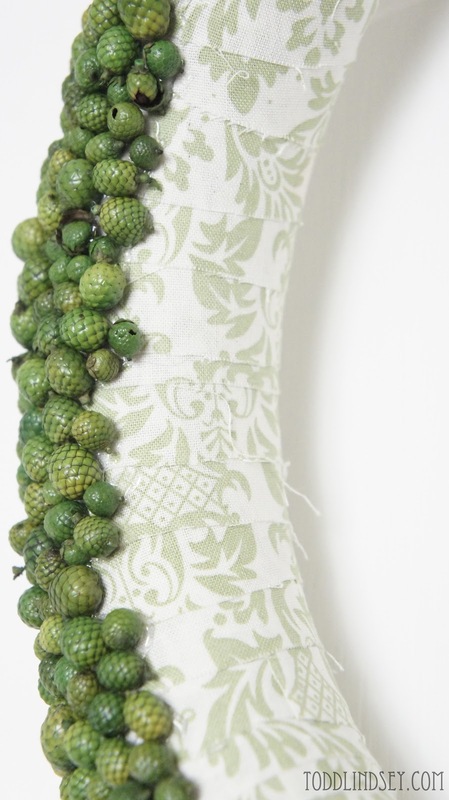 I then attached little green acorns in place with hot glue, gluing in small sections at a time. 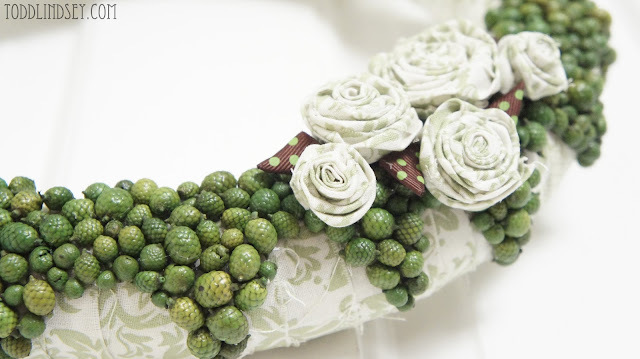 I got the acorns on Christmas clearance from Michaels... but I am sure you can find something similar to use in the floral/crafting section. 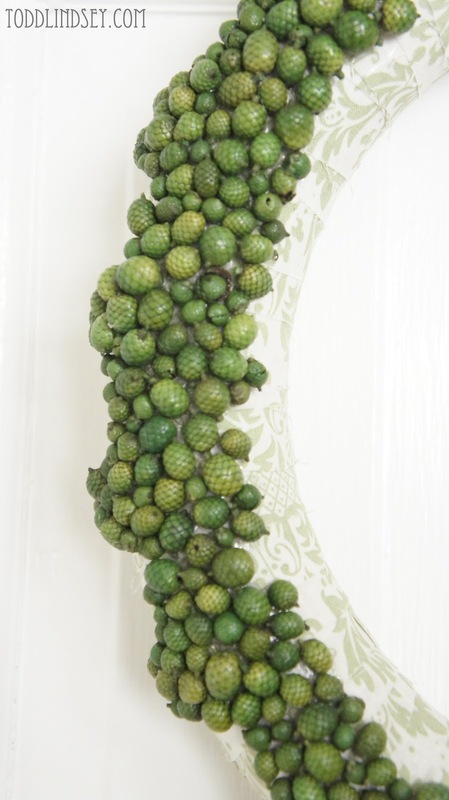 I have also seen wreaths made with split peas, lima beans and even popcorn kernels! All of those would work as well. The wreath was looking pretty good at this point... but nothing special. I decided it needed a little something else. I looked up how to make fabric rosette flowers on Google and found a great tutorial here. 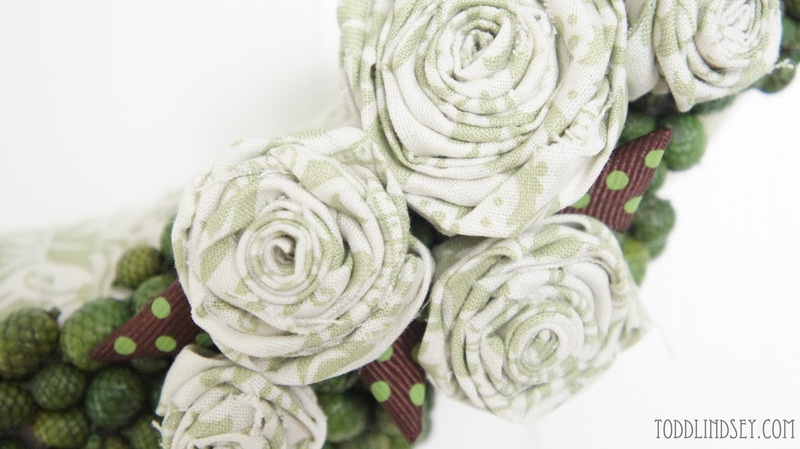 Before I wrapped my flowers, I "hemmed" my strips of fabric with hot glue. 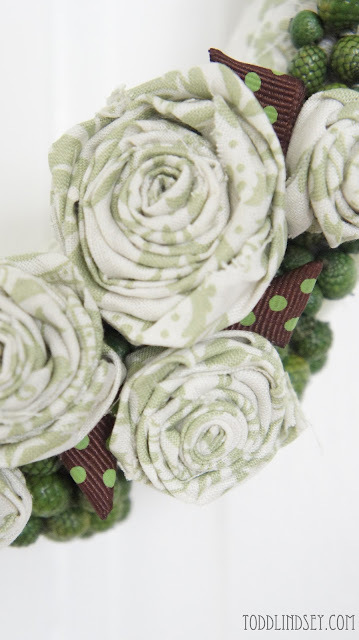 To add a little more contrast with color, I took some brown ribbon with green polka dots and folded them into triangles... kind of like how you fold a flag. I used my handy hot glue gun to keep the "leaves" in place. 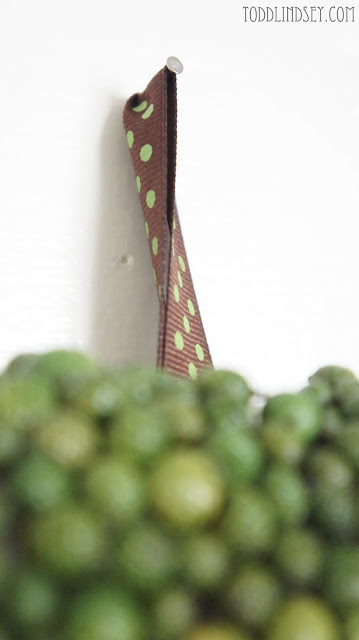 I used the same brown ribbon as my hanger. I used a straight sewing pin with a little dab of hot glue to keep it in place on the back. And voila! I noticed several stings of hot glue so to remedy that problem, I took my hair dryer to it. Oh my that is stunning! The color against the crisp white is divine! Nice work lady! Just beautiful, and made me think of spring, just what I needed with all this snow on the ground. LOVE this! How creative, and it turned out beautifully! Great idea! What a beautiful wreath! Very inspiring. This is really pretty! I love the colors and the simple clean look of it. Thanks so much for sharing! 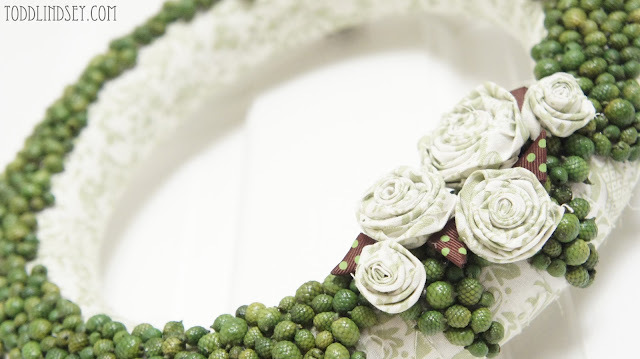 I love the sides of the wreath--the points. Really wonderful. I want this in my home! Wow! It's so pretty! 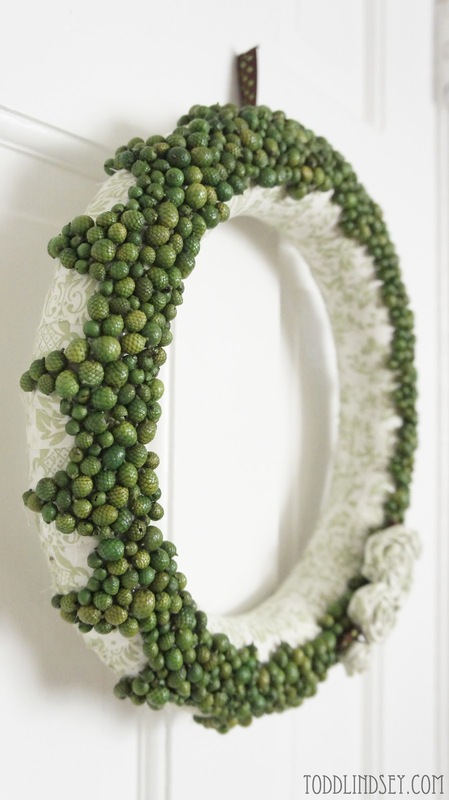 a true piece of art/wreath! It's beautiful, Lindsey! 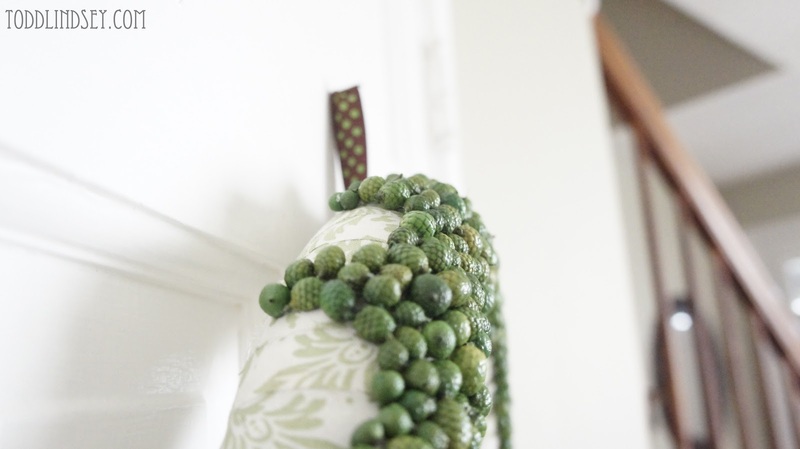 I love the acorn design and the mix of textures. I'm including a link back in this week's highlights. ;) Thanks for sharing your creativity! 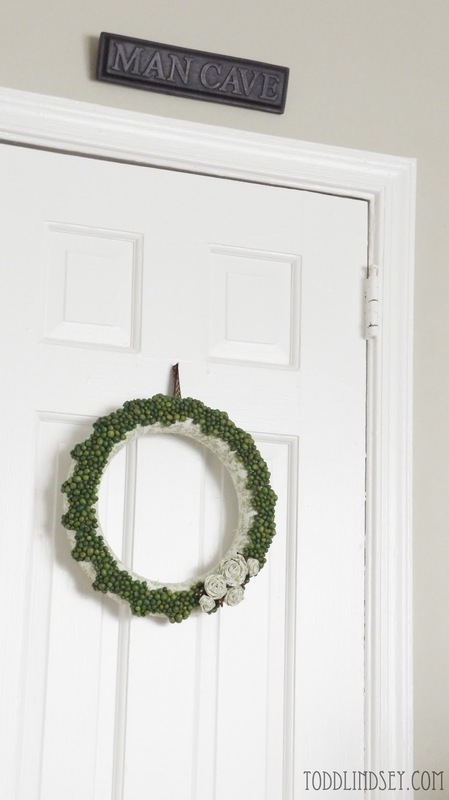 Your wreath is so creative! I too have seen them made from split peas, etc, but what I really love about yours was the pattern that you made with the acorns. 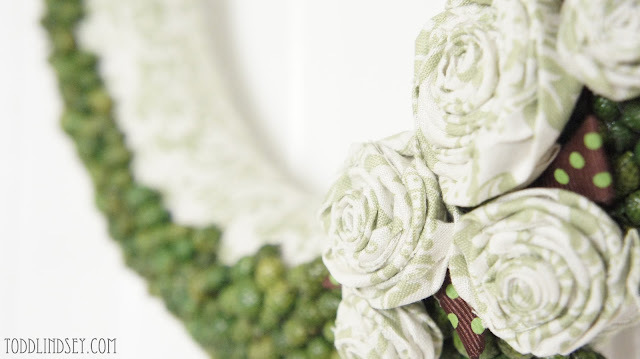 Plus, the flowers were the perfect finishing touch. Pinning for future inspiration!